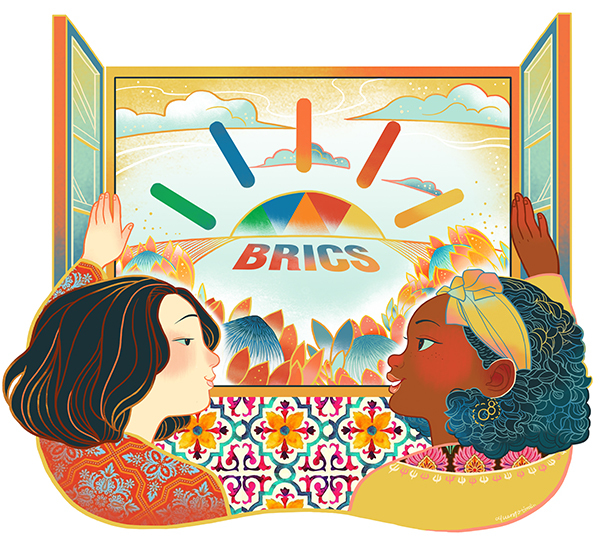 With the 10th BRICS summit in Johannesburg wrapping up with some bold decisions and the Forum on China-Africa Cooperation scheduled for September in Beijing, it is an opportune moment to reflect on the developmental trajectories of African countries and China and to assess the prospects technology and new innovations hold for the kind of economic transformation Africa is looking to achieve. Africa still faces innumerable developmental challenges－some old, some relatively new. Since new challenges are constantly emerging, they can seem overwhelming. Under these conditions, it is essential that the key players on the continent, particularly in the economic sphere, thoroughly evaluate the set of tools at their disposal that will allow them to not only drive the economic transformation of Africa, but also help all African countries to realize their developmental aspirations at a faster rate than before but by causing less harm to the environment. E-commerce is a key pillar here. It is often cited that one of the reasons why China has managed to develop at the pace it has is that, during its industrialization process, it had the kinds of technologies which allowed it to leapfrog many of the stumbling blocks that many of the economies that industrialized before it had faced. As Africa's largest trading partner, China has an important role to play in supporting the African economies in these endeavor, because e-commerce companies such as Alibaba have a vital role to play in facilitating Africa's growth and economic expansion. For example, they can expand the access between the two markets and make their exchanges more effective. So where does e-commerce in Africa currently stand, and what role could it play going forward? E-commerce in Africa is experiencing a rapid uptick both in terms of sales of goods to African consumers and sales by African producers and merchants. For example, Alibaba.com saw an increase in transaction value in Africa of 188 percent and 389.9 percent in 2016 and 2017, respectively. The bulk of this growth has been in Africa's "hub economies" of South Africa, Nigeria, Kenya, Egypt and Morocco, as well as markets such as Ghana, Ethiopia, Sudan and Algeria. While this growth is from a relatively small base, its pace is indicative of the fact that conditions are ripe for explosive growth in e-commerce in Africa. The high rate of mobile phone penetration, growing internet penetration－which currently is about 35 percent－and the fact that almost 300 million Africans have mobile wallets, eclipsing the number of Africans with bank accounts, mean the need for traditional commercial infrastructure can be sidestepped. Achieving this would require players such as Alibaba that have already established a firm foothold in Africa's e-commerce market－with 4.2 million consumers making purchases through its retail portal AliExpress in 2017－to develop solutions that fit the African context and consumer. Apart from helping Africa's growing middle class to bypass the traditional, often more costly, retail channels, the e-commerce platforms are also making it possible for African producers to reduce many of the barriers to access markets around the world. This is crucial for Africa as it seeks to embark on a journey toward industrialization at a time when other regions already have extensive reach and presence in the world markets. E-commerce thus acts as a leveler for emerging African producers and industrialists looking to find foreign markets. As key high-level meetings take place between China and Africa, consideration must be made for the importance of e-commerce fostering cooperation toward meeting the continent's developmental objectives, especially because of the ability of e-commerce to fast-track certain elements of the process of economic expansion. The author is a visiting scholar at Peking University.